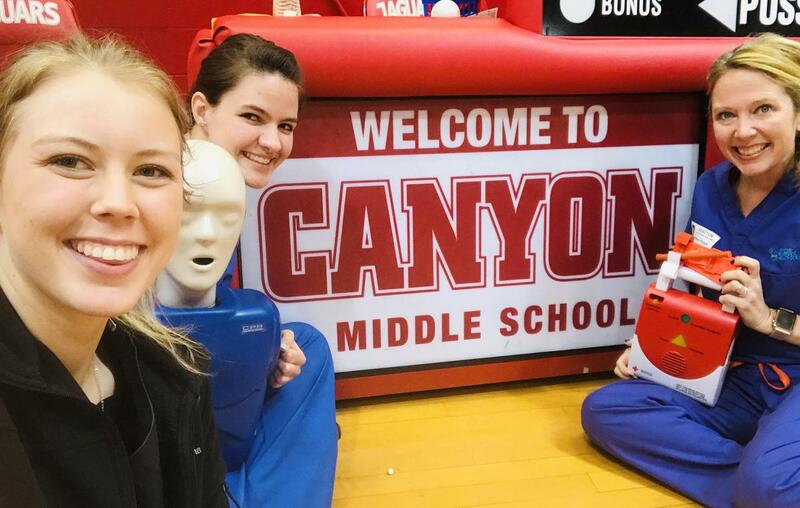 Instead of running, dancing or exercising during physical education, athletics and dance class recently, every middle school student in the district, that’s 5,642 total, learned hands-only CPR, tourniquet application and how to use the emergency 911 system. “Control the Bleed is intended to cultivate grassroots efforts that encourage bystanders to become trained, equipped and empowered to help in a bleeding emergency before professional help arrives,” says Ashley Hoppe, business director with H.I.S. and the program’s facilitator. “We couple this lesson with a hands-only CPR lesson. This year, the H.I.S. team presented the Stop the Bleed lesson at each of the district’s seven middle schools in February during every physical education, athletics or dance class. The CPR lesson was broken into three simple steps for students to easily remember. Step 1 – “Hey, hey, are you OK?” Students are taught to verify whether or not the person who is ill needs CPR or some other medical assistance. Step 2 – Dial 911. Students are taught the importance of the 911 system and how it works. Step 3 - Push hard. Push fast. This is the hands-only compression CPR lesson. Students are taught that good, quality compressions are important to give someone who needs CPR. The simple act of knowing how to use a tourniquet, can save a life, Hoppe says, especially since students may encounter emergencies in their everyday lives from household and outdoor accidents to recreational and extreme accidents. The Control the Bleed project at Comal ISD began four years ago in response to the increase in school shootings nationwide, says Courtney Nesloney, RN, the district’s health services coordinator. Tourniquets and control the bleed stations were purchased and placed at all Comal ISD campuses at that time. 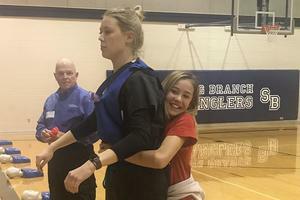 In addition to teaching middle school students these important lessons, ninth grade students receive instruction in their biology classes; and CPR training is required by the State of Texas for all students before they graduate from high school. Comal ISD staff members are trained annually as well by campus nurses on tourniquet use and bleeding control, and school nurses have attended several training sessions on casualty and trauma care to better be prepared for any events that may occur on a campus or in the community. 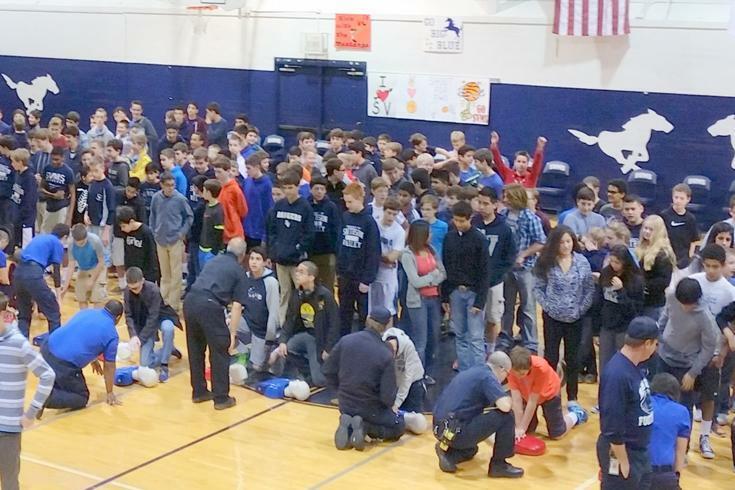 -Students at Smithson Valley Middle School practice CPR compressions during a Stop the Bleed presentation in February. -Spring Branch Middle School student, Shelby Leonard, demonstrates a life-saving technique with the help of trainers from the Healthcare, Innovations and Sciences (H.I.S.) Centre in Bulverde. Pictured is Retired Col. Steve Stevenson and Kelsey Brown. -Representatives from the Healthcare, Innovations and Sciences (H.I.S.) Centre in Bulverde visited every Comal ISD middle school in February to teach CPR, tourniquet and 911 protocols. Pictured from left is Kelsey Brown, Elizabeth Dillard and Ashley Hoppe.